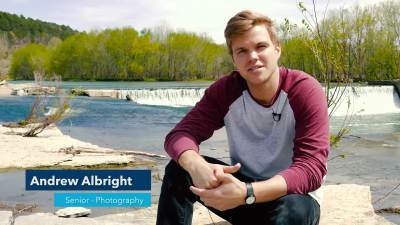 Andrew Albright: My name is Andrew Albright, I'm a photography major, Senior at John Brown University. Today we're out here at Twin Falls shooting wet paint collodian. It's a long process, it's a process that has to be done all in one stage. So you actually have to take a metal plate, you coat that with a collodian mixture, and the silver nitrate then sticks to the collodian. And when you pull that out, you have a surface that's able to take an image. And so then you run off, and you have to shoot that, while it's wet. You bring it back, and while it's still wet you have to develop and fix that image. So you have to do the entire process from beginning to end in about three to five minutes before your plate has time to dry. Well, this was the first time I've actually done all of the steps by myself. It was a little stressful, cause there's a lot to remember, rather than just shooting digital where it's quick and it's fast and you can see the result right away. This takes time. This is a very hands-on process. Every single one of these plates is one-of-a-kind. You can shoot the same camera in the same location, the same light ten times and every single plate will be slightly different. So there's something very interesting about the process itself that I think students really connect well with. It's a lot more preparation, which I think makes the images matter to me more, just because I put more into them rather than just setting up a shot and clicking a button. It's interesting, it's not perfect, but it's good. And imperfection is pretty cool too.